Ever since Ukraine's first post-Soviet elections in 1991, there were hints of the impending crisis that now engulfs the country, as a the proxy maneuverings between the Great Powers of Russia and the European Union. In the December 1991 presidential election, the first free elections in the country since 1918, there was on overwhelming victory for Leonid Kravchuk, running as an independent but previously holding the position of secretary of the central committee of the Communist Party of the Ukraine, and going on to organise the Social Democratic Party of Ukraine (united). The runner-up was Viacheslav Chornovil, a well-known dissident of the 1960s and 1970s, who headed the centre-right People's Movement of Ukraine which at the time included everything from liberal communists, through to liberal democrats, to proto-fascist nationalists. Whilst Chornovil received only received 23% of the overall vote, three western regions gave him a majority, and one (Lviv) with 75% . It was the hint of what was to come. By the 1994 the east-west divide in Ukraine became very evident. Leonid Kuchma defeated Kravchuk 52% to 45%, with Kuchma receiving handy support from the Socialist Party of Ukraine, whose candidate Oleksandr Moroz received 14% in the first round. 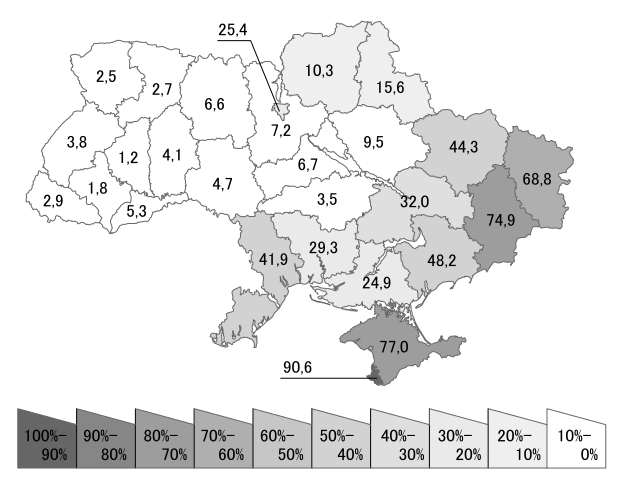 In the far-east Luhansk Oblast 88% voted for Kuchma, and in the far-west Lviv Oblast Kravchuk received 94% - one may note that this was the same region that had only given him 11.5% of the vote a mere three years previously. Kuchma won all the provinces in the east, and Kravchuk all the provinces in the west; only in the cental provinces of Mykolaiv, Cherkasy, and Kirovohrad was there a contest which bore some resemblance to the final vote. In the following election, in 1999, a resurgent Communist Party won almost 40% of the second-round votes, with Petro Symonenko challenging Kuchma. The Communists won several provinces in the central and southern regions, with the far-west provinces this time supporting Kuchma, three of them with over 90% of the vote. This was the prelude to a crisis. Events led the 2004 election to have three rounds rather than the usual two. The former president, Leonid Kuchma, had been subject to the "cassette scandal", where audio recording were revealed in late November 2000 by Socialist Party politician Oleksandr Moroz of Kuchma approving the sale of military equipment to Saddam Hussein, and ordering the police minister to "take care" of journalist Georgiy Gongadze, who disappeared in September and whose mutilated headless corpse was found in early November. Kuchma was not prosecuted until 2005, and was surprisingly cleared of murder in 2011 . The elections were heavily contested between the opposition leader Viktor Yushchenko and the incumbent Prime Minister Viktor Yanukovych from the Party of Regions. In the first round Yushchenko received almost 39.90% of the vote to Yanukovych's 39.29%. The candidates of the three socialist parties (Socialist Party of Ukraine, Communist Party of Ukraine, Progressive Socialist Party) received a combined vote of 12.32%. In the second round the official Central Election Commission declared Viktor Yanukovych elected with 49.46% of the vote against Yushchenko's 46.61%, with heavy biases towards Yanukovych in the east and Yushchenko in the west. The Yushchenko camp rejected the results claiming voter intimidation, corruption, and electoral fraud. Civil resistance was declared with Kiev as the focal point mainly organised by the student- and youth-led PORA group, especially Maidan Nezalezhnosti (Independence Square), including a march of 500,000 using the orange colour of Yushchenko's electoral campaign. On December 3, Ukraine's Supreme Court invalidated the election results, and ordered a rerun of the second-round election. With strong scrutiny from international observers, the rerun second-round saw a victory for Yushchenko, who received about 51.99% of the vote, compared to Yanukovych's 44.20%. In the 2010 election, one of the main leaders of the Orange Revolution and natural gas businesswoman, Yulia Tymoshenko, who was now Prime Minister, ran against the Viktor Yanukovych who, as opposition leader, was still representing the Party of Regions. In this case Yanukovych received 48.95% in the second round, to Tymoshenko's 45.47%. Once again, the vote was heavily split with Yanukovych receiving notable majorities in the east and south, and with Tymoshenko receiving heavy votes in the west. Tymoshenko initially appealed the results to the Supreme Administrative Court, but withdrew shortly afterwards. After the election, in 2011, Tymoshenko was convicted of embezzlement and abuse of power, and sentenced to seven years in prison and ordered to pay the state $188 million. This conviction was largely considered politically biased by organisations such as Human Rights Watch and Amnesty International. From 2008 onwards attempts had been made to establish a political and economic agreement between the Ukraine and the European Union. These agreements came under difficulties following the prosecution and sentencing of Tymoshenko, expressed as a requirement for "respect for common values and the rule of law with an independent judiciary" . In February 2012 the European People's Party demanded the immediate release of Yulia Tymoshenko and insisted that the Association Agreement between Ukraine and the European Union should not be signed and ratified until these demands were met. Whilst the EU Association Agreement was signed in March 2012, as of November 2012, neither the European Parliament or the European governments had signed the accord as Tymoshenko and Yuriy Lutsenko remained imprisoned. It may seem unusual that the massive protests leading to a revolution would be be inspired by the signing of a free trade treaty, especially for those who suffer such events with regularity, but in Ukraine the issue had come to a head. Half the country was looking towards the EU, half was wanting to have a bit of both ways, and the government had been told quite bluntly by the EU that they could not do so, along with less than subtle hints from Russia concerning "trade sanctions" and "security concerns". Protests, dubbed the Euromaidan ("Eurosquare") began in late November 2013, demanding closer and faster integration with Europe. Although the Kiev protester numbers at the stage was around 10,000 at best, mostly students, special police units attacked the protesters with stun grenades and tear gas. On December 8, an estimate 500,000 people engaged in a mass protest, mostly because of the previous police brutality. Shortly afterwards an attempt to clear Independence Square by Berkut special police units and Internal Troops failed. In December, Yanukovych and Putiin signed a Ukrainian-Russian Action Plan, whereby Russia would buy $15 billion of Ukrainian Eurobonds and that the cost of Russian natural gas supplied to Ukraine would be lowered to $268 per 1,000 cubic metres from $400. From Yanukovych's point of view, this would ensure the standard of living among Ukrainians. From the opposition's point of view, it prevented agreements with Europe, and as a result the Euromaidan protests continued, reaching revolutionary tipping point in February. On 18 February, the worst clashes of Euromaidan broke out after the parliament did not accede to demands that the Constitution of Ukraine be rolled back to its pre-2004 form, which would lessen presidential power. Police and protesters fired guns, with both live and rubber ammunition, in multiple locations in Kiev. Eventually riot police retreated and Yanukovych and many other high government officials fled the country as the parliament impeached Yanukovych, replaced the government with a pro-European one, and ordered that Yulia Tymoshenko be released from prison. After the 2014 revolution, Russia refused to recognize the new interim government, and quickly seized control of the Crimean Peninsula in Ukraine. In Crimea sixty percent of the population considered Russian and repeated polls by the UNDP in Crimea indicated that approximately two-thirds of the population supported integration with Russia. With the revolution against the Yanukovych government, the Presidium of the Supreme Council considered holding a referendum on the peninsula's status and asking the government of Russia; the Security Service of Ukraine responded by opening a criminal case to investigate the possible "subversion" of Ukraine's territorial integrity. On 27 February, unidentified troops seized the building of the Supreme Council of Crimea and the building of the Council of Ministers in Simferopol, raising Russian flags. The Crimean government argued that, despite the revolution, it still considered Yanukovich as the de jure president of Ukraine. Shortly afterwards security checkpoints were installed on the Isthmus of Perekop and the Chongar Peninsula, cutting of Crimea from the Ukraine. In early March, with Crimean government support, Russian troops moved from their military base in Sevastopol and along with troops, armor, and helicopters from mainland Russia establishing control over the peninsula. Concurrent with the Russian military intervention, the Supreme Council of Crimea organised a referundum on Crimea's status, Ukrainian court decisions of the illegality of such act notwithstanding. The referendum questions were unusual; whether Crimea should accede to Russia or restore the 1992 constitution within Ukraine. It did not contain an option to maintain the status quo of governance under the 1998 constitution. Official results suggested a high turnout (83.1% in Crimea, 89.5% in Sevastapol) with an overwhelming majority voting for independence (96.77% and 95.60%, respectively). Thirteen members of the United Nations Security Council voted in favor of a resolution declaring the referendum invalid, but Russia vetoed it and China abstained. The United Nations General Assembly resolution was later adopted, by a vote of 100 in favor vs. 11 against with 58 abstentions, which declared the referendum invalid and affirmed Ukraine's territorial integrity. Following the referendum, pro-Russian separatists in Crimea declared its independence from Ukraine and requested to join the Russian Federation. Crimea was not alone however; pro-Russian protesters occupied government buildings in Donetsk, Luhansk, and Kharkov Oblasts. In the former two oblasts, protests escalated into an armed separatist insurgency, with a declaration of independence of Donetsk People's Republic on April 7 and Lugansk People's Republic on April 27, and a subsequent referendum on May 11 confirming the declaration. The Donetsk People's Republic declared a voter turnout of 74.87% with 89.07% voting for independence, and the Luhansk People's Republic a 75% turnout with 92.2% voting for independence; the Ukrainian Interior Ministry claimed a turnout of 32% and 24% respectively. On May 22nd, agreements were signed between leaders of two self-proclaimed republics on 24 May and on 24 June, declared the official merger of their constitutions, and creating the Federal State of Novorossiya as a confederate "Union of People's Republics". Following the May agreement, a significant battle broke out between separatist insurgents that had controlled of Donetsk International Airport, and Ukrainian government forces, with fifty insurgents killed and the airport captured by the Ukrainian milkitary. Fighting continued through the month of June; the despite the new Ukrainian president Petro Poroshenko's issuing a peace plan (which did not include negotiations with separatists) , a renewed government offensive forced insurgents to withdraw from northern Donetsk Oblast, and with the last twenty-four hours, capturing Sloviansk. At this stage there is virtually no chance that Crimea will be reintegrated with Ukraine. Strategically important, and with a long ethnic association, and extremely defensible on land, Crimea is Russia's gain. After losing something close to an ally in mid-February, by the end of the month Russia had something of a real victory. There is nothing strategic in Russia intervening in Novorossiya regardless of the desires of the local population. Indeed, rather like Pridnestrovie (Transnistria) in Ukraine's south-west which has been de facto independent from Moldavia since 1992, it is very useful for Russia to have such separatist movements acting as buffer zones, a perpetual nuisance to the pro-European Ukrainian government with the threat of annexation. It is fair to say that neither the European Union nor Russia has behaved in an exemplary manner over Ukraine. The demands of the EU against Yanukovych's attempt to satisfy both the requirements of the EU Association Agreement and the Customs Union made blunt sense in terms of their desire to push eastwards, but it also forced Russia's hand in a manner that should have been expected. The jailing of opposition leaders by Yanukovych's government is suspect at best; it is hard to describe the imprisonment of Tymoshenko and others as not being political - and yet the same can be said about the dropping of legal challenges against Kuchma. It is almost as if that the Ukraine does not have a mature democracy, but rather criminal gangs that use a democratic system as a public relations exercise. Then there is the disconcerting existence of fascists that seem to be in both camps with their own mad nationalist fervour. In these circumstances it is almost trivial to describe an idealised alternative of what could be the case in Ukraine, given that the reality on the ground is so bad. One can imagine a genuinely democratic parliamentary system with a separation and balance of powers and a codified and respected level of civil rights and personal liberties. Once can imagine a country which would be able to determine its own economic and political future that could look both east and west without fear or favour. One could imagine even the circumstances where properly constituted referenda were run by independent electoral commissions with international observers to determine, oblast by oblast, whether they wished to be part of the Ukraine, whether they want to an independent republic, or to join another country entirely. Because, as we've seen in places where the major powers are indifferent, a country can even split in half amicably (e.g., the dissolution of Czechoslovakia). The fact that that such a situation can be thought of, yet also considered utterly counter-factual, indicates of how far down the mire that the Ukraine has gone - and yet, also an opportunity for a political group that take such principles against the temptations of corrupt powers that use Ukraine as a pawn in their larger geo-political game. Commenting on this Page will be automatically closed on September 7, 2014. This is really outstanding, the best short guide to this complexly tormented topic that I've read. This was also posted on talk-politics where it received "highly recommended" status. It is also frustratingly predictable that something like Malaysian Airlines Flight 17 would occur; a genuine tragedy, "the remorseless working of things" (Whitehead).